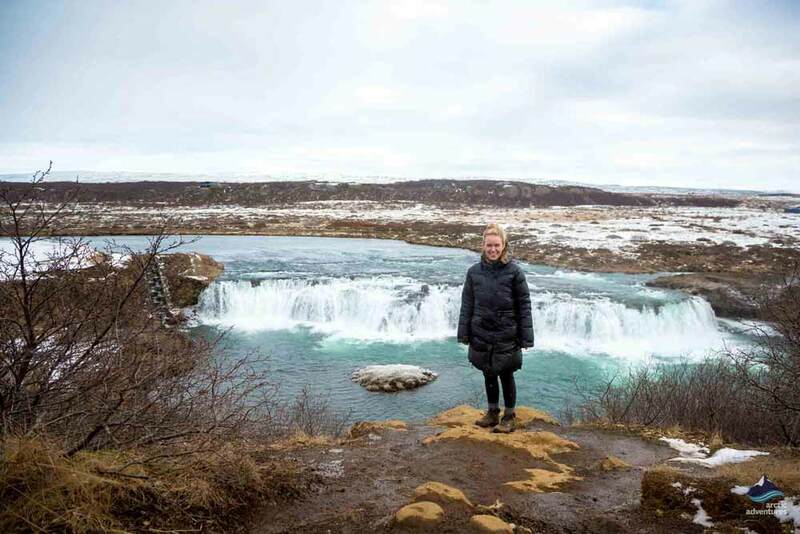 This is the optimal Golden Circle tour – Thingvellir national park, Gullfoss waterfall and Geysir hot spring area in a small group setting with some added flair. 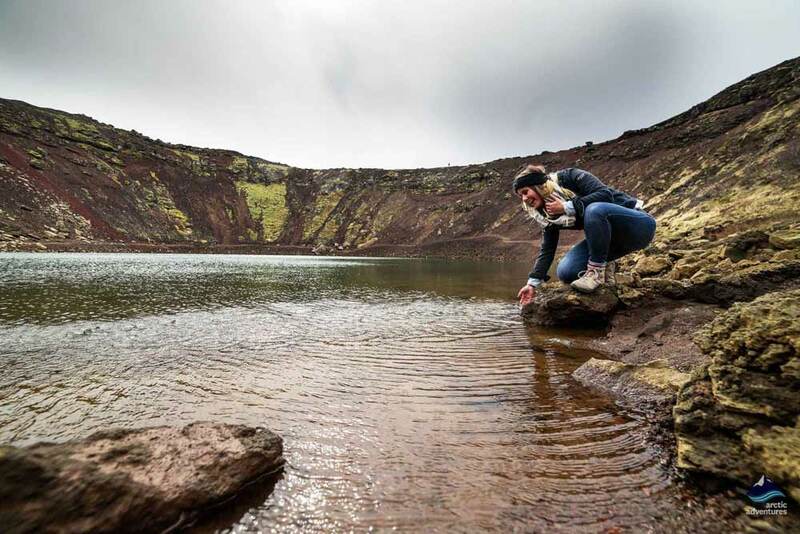 This is the perfect way to spend a day in Iceland as your will be exploring some of the most beautiful sites the country has to offer. 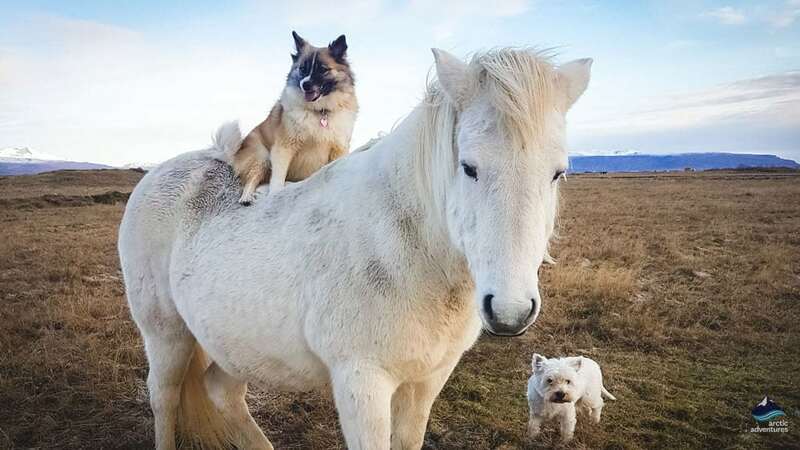 We will also stop at some more “off the beaten track” spots, for example, the Hellisheiðarvirkjun Power Plant, Efsti-dalur farm, the stunning Faxi waterfall and the crater Kerið and we’ll even stop and say hi to some horses on the way! Be amazed by gushing geysers, powerful waterfalls, and historical sites. 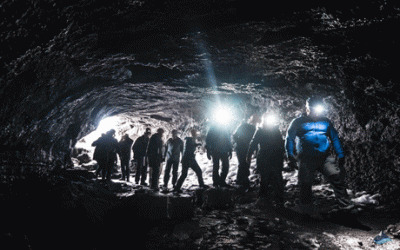 Visit a World UNESCO Heritage site where the tectonic plates meet and explore the best Iceland has to offer. 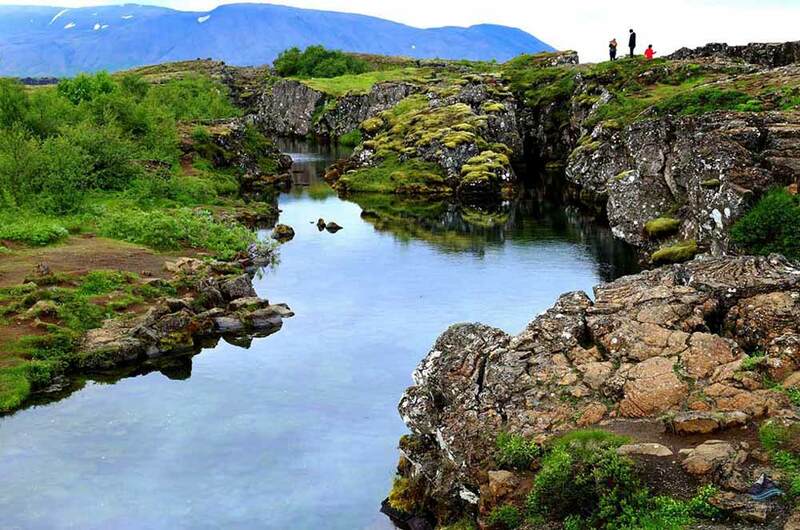 From Reykjavik you will drive towards Iceland’s three most famous attractions that make up the popular Golden Circle; Thingvellir National Park, Geysir hot spring area and Gullfoss Waterfall. 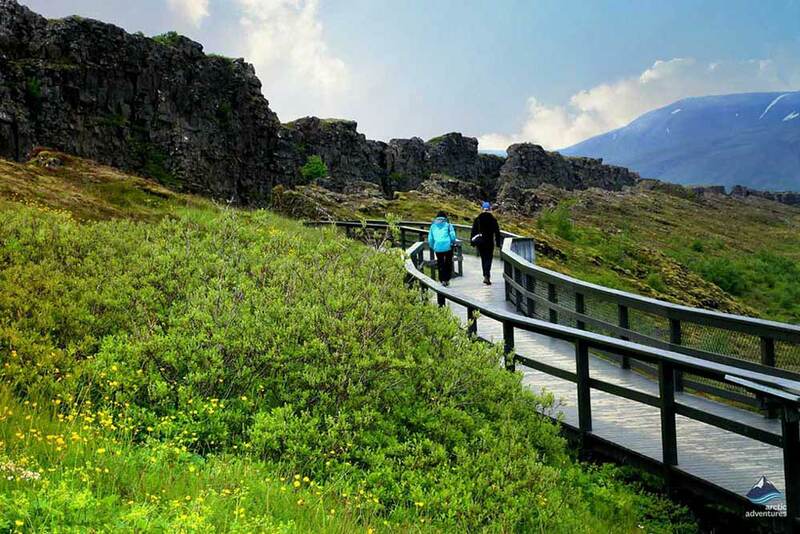 The Golden Circle is one of the most popular routes visitors take in Iceland. 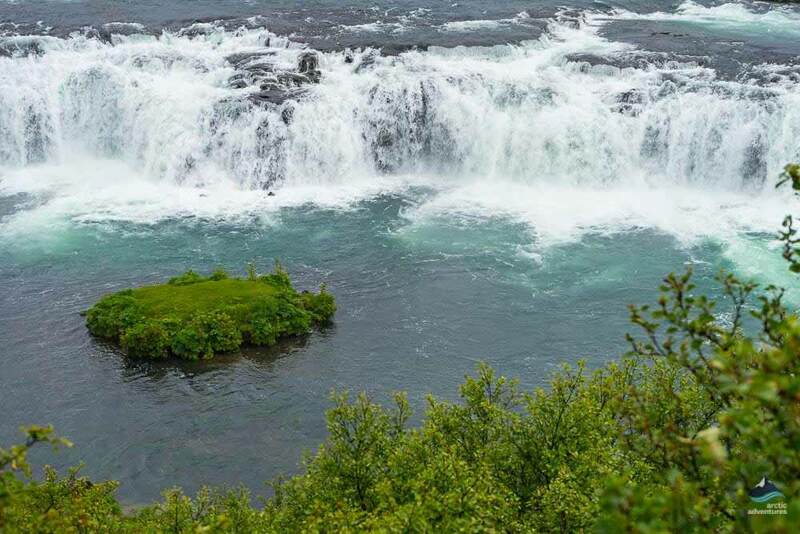 The circle consists of three major attractions; Thingvellir National Park, Geysir hot spring area and Gullfoss waterfall. We make sure that you get enough time to take in the magnificent landscape and the rich history that is found at every footstep. Þingvellir e. Thingvellir national park is strongly rooted in the Icelandic history and is famous for numerous reasons. 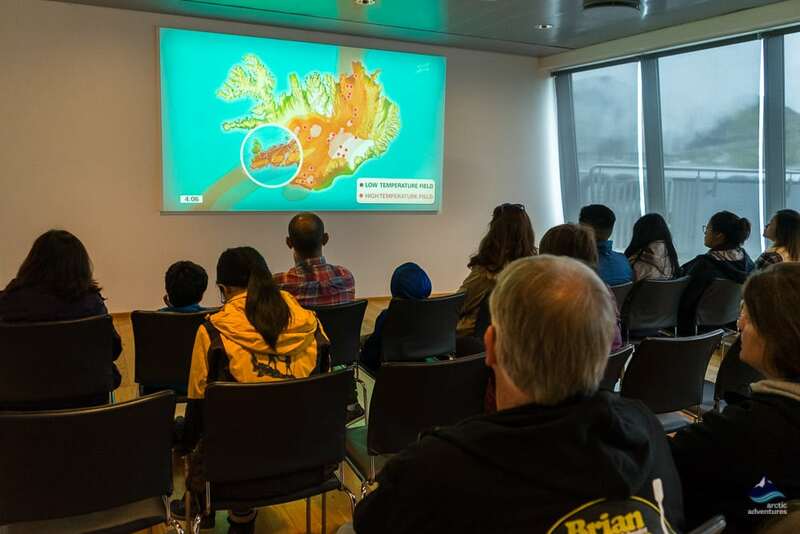 It’s a UNESCO heritage site, it’s where Iceland’s first Althing (e. parliament) was founded in the year 930 and it’s where the tectonic plates drift apart. 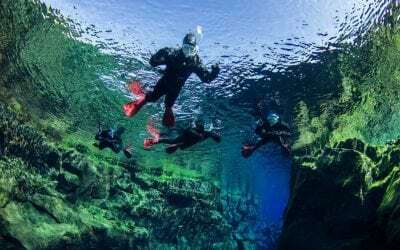 It’s the home to the magical Silfra and this place is simply stunning. The waters, pond, and fissures are extraordinarily clear and the history of the place is endless. This UNESCO world heritage site is a place that should not be missed. 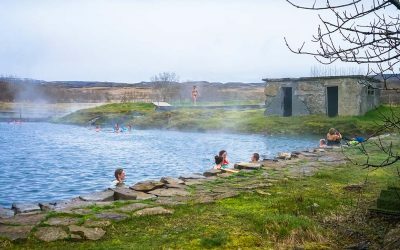 Geysir hot spring area is located in Haukadalur valley. 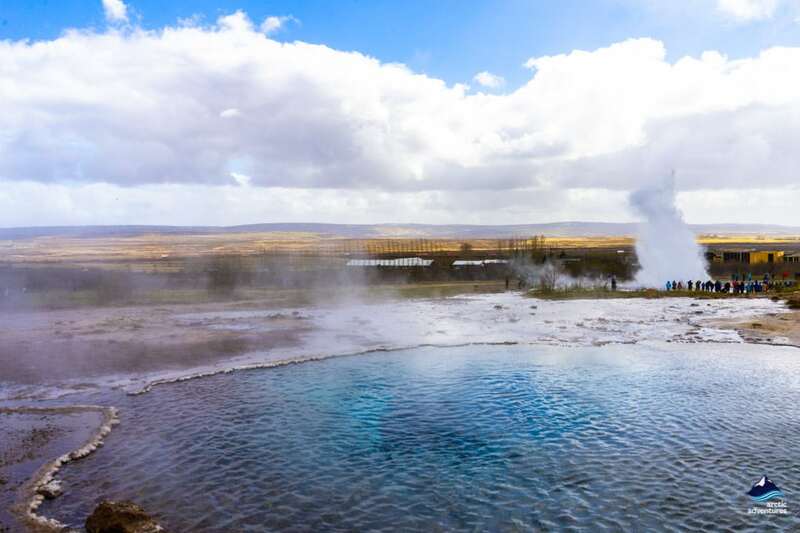 It’s where the Geysir which all other geysers are named after is located and the area is filled with steam and magical geothermal phenomena. This most active geyser at the moment is Strokkur, it goes off every 4-10 minutes and treats us to a show that gives you that tingly feeling in your stomach. 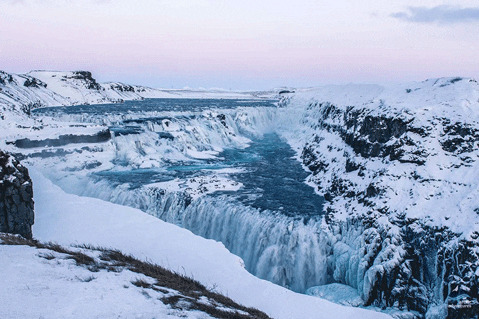 Gullfoss or the Golden Falls are next up on the itinerary. It’s one of the most powerful waterfalls in Iceland. It drops little over 30 meters and has two drops. It has been a local’s favorite since the Viking times and now it’s your time to explore it. Hellisheiðarvirkjun Power Plant will be the first stop that will be made on this tour. 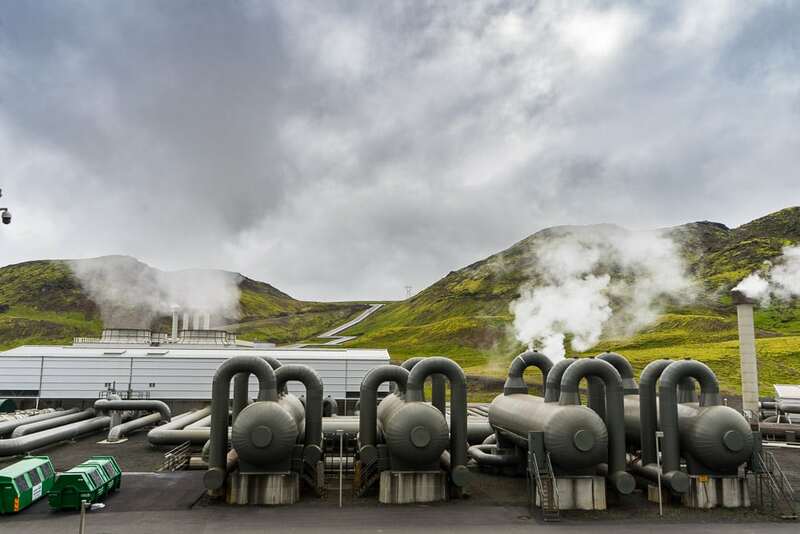 It is the largest geothermal power station in Iceland and the largest single-site geothermal power plant in the world. 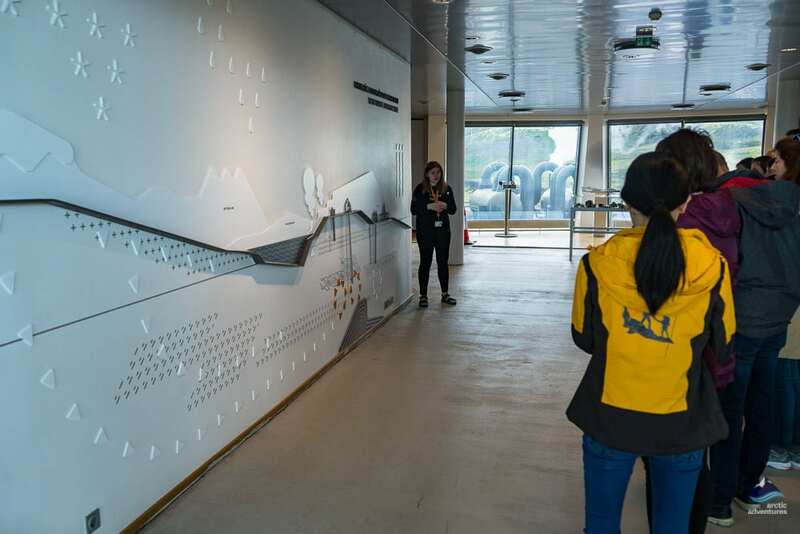 There they have an exhibition that recently opened and houses an interactive exhibition centering on the development of geothermal energy in Iceland. 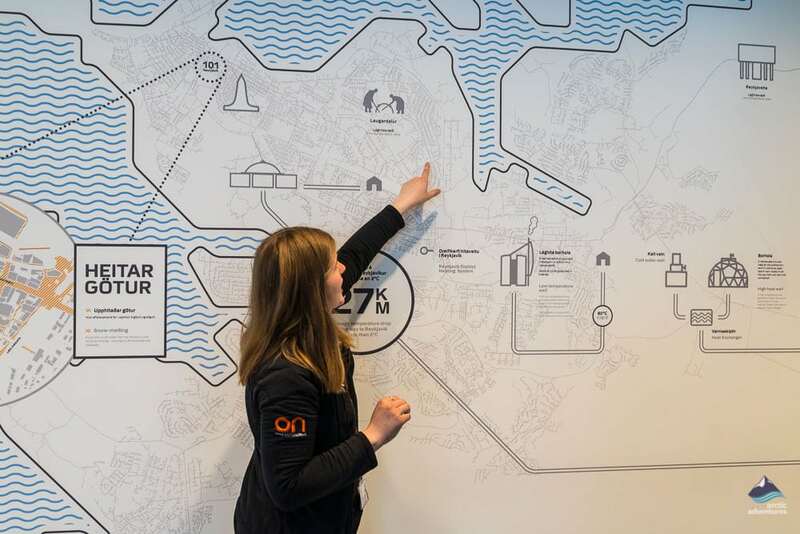 This part will give you a better look into the geothermal energy of Iceland, how we make and use the energy. 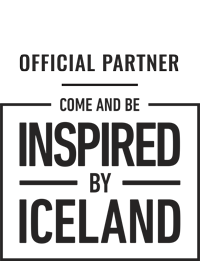 This is all presented in an accessible and fun way through informative and entertaining multimedia exhibits. 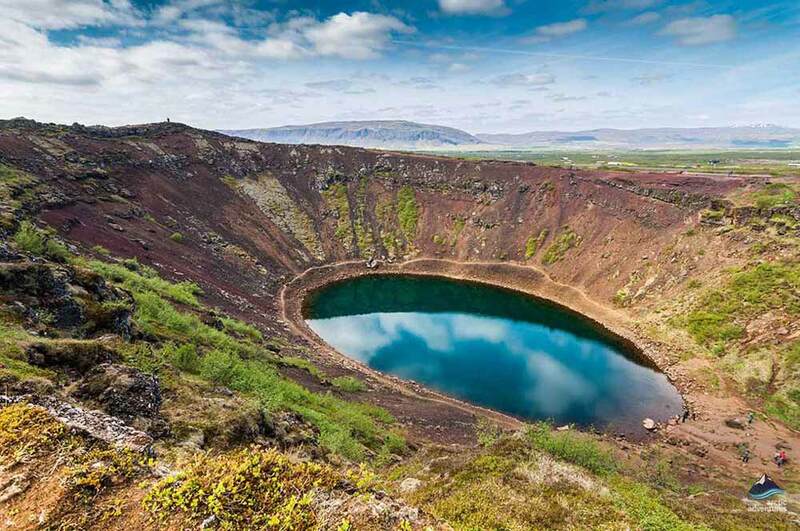 Kerið is a volcanic crater lake. Craters are usually formed by volcanic explosions but researched has shown that this might not have been the case for Kerið. It formed when a cone volcano erupted and emptied its magma reserve. The cone has since then collapsed into its magma chamber and by that created a crater. Due to the formation, the colors are very different and unique. Skálholt is one of Iceland’s most historical sites, located on the South Coast. It was the epicenter of culture, politics and learning in Iceland for over 700 years. 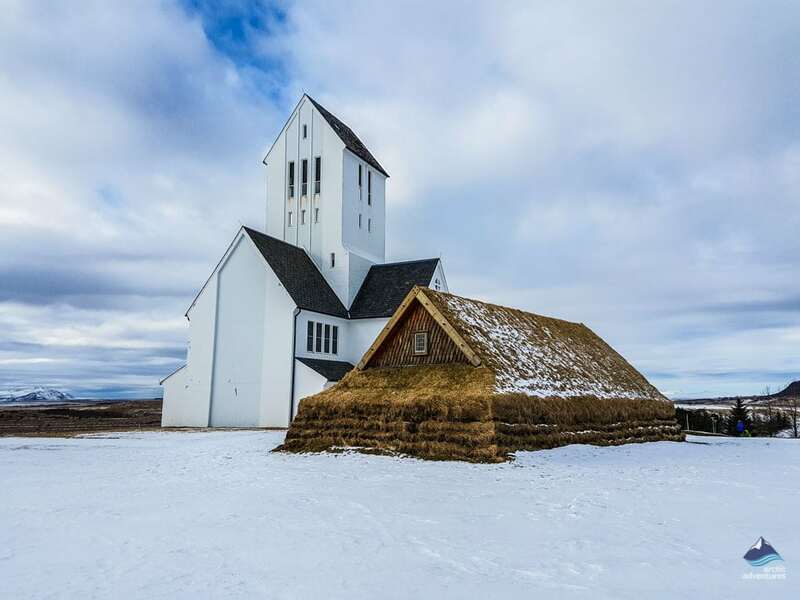 Explore the replica turf house, which was Iceland’s heritage building style. Faxi waterfall is next up. This beautiful blue fall is a quite hidden and for that wonderful reason, not a busy site. This stunning location is covered with birch and has a sweet charm about it. This is one of those waterfalls you would stare at all day and actually a popular kayaking spot for many of our guides. 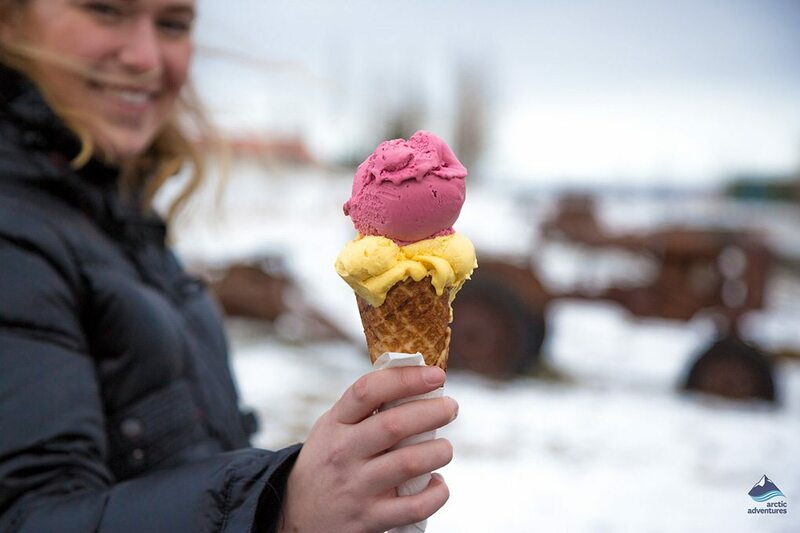 Efstidalur farm is a perfect stop after the Golden Circle. Efstidalur is a family farm located close to Laugarvatn lake. There‘s an ice cream barn at the farm and the concept is really alluring, you can enjoy different flavors of ice cream produced from the milk of the cows living at the farm. It really doesn’t get more local than this and the taste of the ice cream is otherworldly! 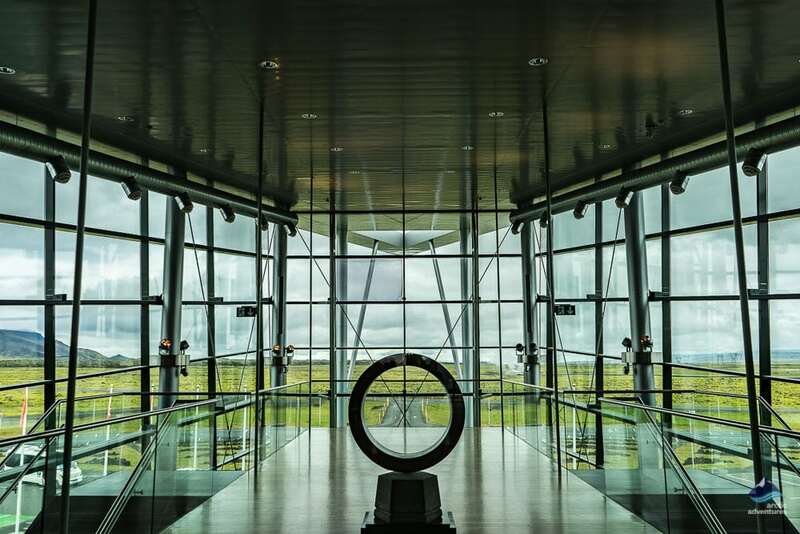 Pick-up: Your Golden Circle small group sightseeing tour starts with pick up from your selected location in Reykjavik. Please note, that the pick up can take up to 30 min. Remember to bring: Warm and waterproof outdoor clothing, headwear, gloves and sturdy shoes. Faxi waterfall and Skálholt Historical Site are not visited in December and January due to limited daylight. Price from: 11.990 10.192 ISK per person. Our tour was all the more interesting and fun because of the tour guide we had. Gilly really made our trip fun and interesting telling us all sorts of interesting facts and tidbits and had a great sense of humor. He was well organized and very efficient. The stops along the Golden Circle was so beautiful and simply amazing. It’s a must do! My husband and I booked the Golden Circle tour with Arctic Adventures and it was the best experience! Our tour guide Jónas was amazing, so friendly, welcoming, informative, and just all-around phenomenal. We love small group tours because of how personalized the guides are, and it really made our first experience and impression of Iceland one that we will never forget! 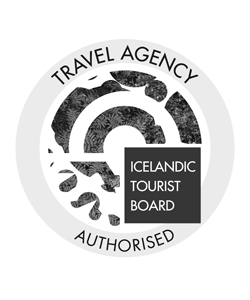 I would book all my tours through this company the next time I visit Iceland. Highly recommend it- you won’t regret it!!! "Small Group Golden Circle Tour - First class experience!" 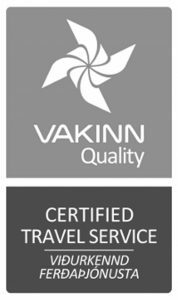 We used Artic Adventures to complete a small group tour of the Golden Circle in Iceland, and the experience we had was first class. 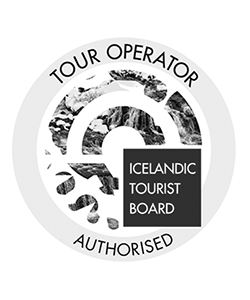 The driver was knowledgeable and friendly, and her English was far better than our Icelandic! 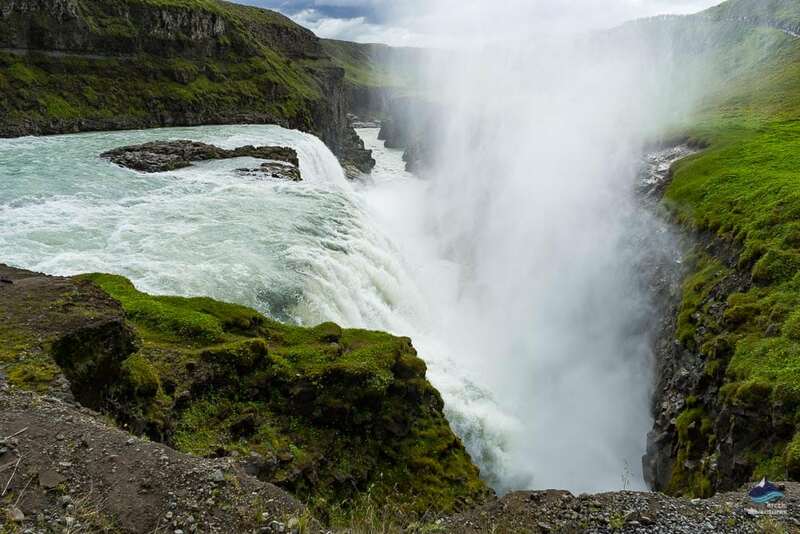 The tour takes in the highlights of the famous Golden Circle, taking in sights such as Gullfoss, Geysir, the Thingvellir National Park and much much more. Definitely recommend and would use again. Hey all, We went on several tours in our week at Iceland, and the tour guide for this particular one was really great! Passionate, enthusiastic, and stuck out to us after the trip. I thoroughly enjoyed the trip we had. We saw the golden circle as well as other sites like a church, ponies, the volcanic crater (my favorite), dairy farm, etc. I would definitely go on it again but I wish we had sliiiightly more time at each stop. It's not horribly short (like 20-40 min each stop) but 10 min longer at each location would have been nicer. Overall it was a REALLY great tour with a nice tour guide. We enjoyed all the stops on our tour. Loved the ice cream place! 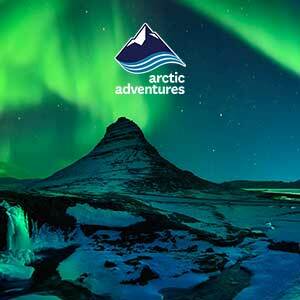 We had a very good experience with the Golden circle Tour at arctic Adventures. The guide, Aron, was very good at informing us of the different sights, but also had many fun facts about Iceland in general. There was good time at the stops and the small group was much better than a regular bus trip. Thank you for a good experience. Fabulous tour to see a variety of sites. A bit disappointing at the Power Plant because their guide spoke limited English and could not thoroughly explain the process at the plant. This had nothing to do with Arctic Tours. Great use of time spread across many beautiful sights. The guide was excellent in his knowledge, helpfulness and sense of humor. The course was great. It was good that the day started with geothermal power facility -it was very informative and helpful in getting to know about Iceland. All the scenic locations are beautiful. I will definitely recommend it to friends.thank you! This Golden Circle Tour made the trip to Iceland worth it! Our guide was so friendly and enthusiastic and even shared personal family history stories with us. Will DEFINITELY book another tour when I come back! What started as a dull dark cold & very windy snowy day turned out to be a great day! Due to weather conditions the tour had to change, the mountain road was closed we waited (to long really) before the guide took a different direction (this could have been gone sooner) but nevertheless we enjoyed our tour, got to see everything, other ppl from our hotel missed a lot out, due to bad weather, so we were very lucky. It’s a long tour but very interesting I’d recommend Artic Tours. This was a first class tour with an excellent and knowledgeable tour guide in Thomas. I'd recommend this tour to anyone as the smaller group means you get much more time at each stop and have the ability to ask more questions and learn more about each of the things you're seeing. The mini bus was very comfortable and whilst the back seats on the bus are small, if you're sitting anywhere else there is plenty of room to get a great view of each of the sights. The stops are just the right amount of time, some around 15-20 minutes with the longer stops around an hour. One of the final stops gives you the change to walk around and meet the bus further up the trail which is a great touch. All in all very good and would both do this tour again and do others with Arctic Adventures. Weather has been against us all week. Tour was delayed by 2.5hrs due to a storm but we were notified and kept up to date. Johannes picked us up at the new time, collected a few others and off we set. Unfortunately some roads were still closed, due to the weather, so we waited a little while longer and were off again. The mountain road was still closed but Johannes took this in his stride and took us a different way. Rain, hail and wind plagued us on and off all day but gave us a few breaks while we stopped at the various locations (Gullfoss, geysir, Þingvellir national park, farm with ice-cream, Kerio volcanic crater, waterfall, Icelandic horses etc). Food at the Geysir was extremely expensive (£50 for 4 soup and bread) so take a picnic. The (very old and battered) mini-bus broke down on us at our last stop but while we were in the National Park a replacement (new, comfy and shiny) minibus was brought to us - so timing was perfect as it didn't affect our schedule. It would have been nice to have had the nice minibus the whole day however. Johannes was a lovely guy and very knowledgeable. All locations were amazing to see so I'd definitely recommend this tour. 1) The guide/driver, Jason, was very good; he was polite and informative, and is a good driver. He instills confidence in people. 2) Some people were usually from 5 to 15 minutes late returning to the bus at each stop. I think that more emphasis should be made as to the importance of returning on time. I had to get back to the ship by 6:30; arrival was actually about 6:15. If people were made more aware of importance of time at each stop, it would be better. I was worried that I might miss the ship! 3) Communication with your office could use some improvement; sometimes it took a long time to get a reply. 4) The tour itself was very interesting. I enjoyed seeing many places which were included. Tour was good, guide was great. Favorite stopp was the huge waterfall,geiseer and Cow farm that made their own icecream also stopp to pet horses. The stops on the tour were fantastic. I was disappointed that we were unable to see the thermal power plant but that was nobody's fault. The tour guide, Thomas, seemed knowledgable but it was very difficult to understand him. I did not learn as much about the area as I would have liked to because of this misunderstanding. Also, I paid for 2 pair of water proof pants but did not receive them.